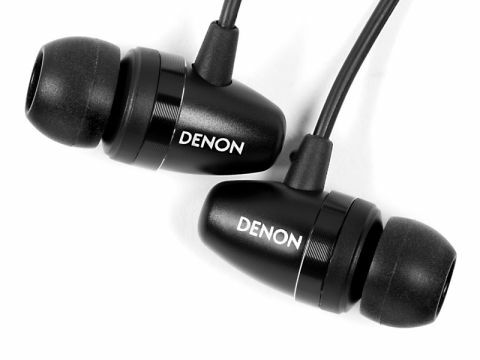 Another range-topper, the Denon AH-C751 has a metal body and is supplied with three sizes of earpiece. The cable exits from the side of the cylindrical body and we had some trouble finding the right angle at which to insert the 'phones into the ear so that they sat securely and the lead did not tend to pull them out. Technical characteristics are typical, with a 16-Ohm impedance and power handling of 250mW which, even with the slightly below-average sensitivity that we experienced, would fairly take anyone's head off. An unusually short cable is fitted, terminated in a very nice metal-bodied plug: an extension cable is also provided, along with a very nice hard carry case. No one transducer is ever going to please all tastes, so it's good to report that this model has distinctively different sound from a lot of others. Most immediately noticeable is the bass, which is strong and full, perhaps too much so for some listeners though we're sure it will bring a smile to many faces. Treble is quite lively though not unpleasantly bright, while the midrange seems generally neutral. If we've a slight concern about the sound then it's in regard to detail, which seems to lag a little behind. It's not quite so easy to hear right into a mix and imaging is less precise too, though in making that comparison we are applying very high standards. Anyone coming to the C751 from cheap giveaway 'phones is likely to be shocked at the amount of detail on offer. The sound is generally very impressive. If the thought of killer bass doesn't put you right off, there is a lot to enjoy from this model.